Do you ever feel like you could do with more energy in the morning? Wake up tired? Whilst it is most likely your sleep quality and quantity that will need to be looked at (there are many things that you can do for your sleep – check out http://thethoughtgym.com/sleepsoundly for more on that), once you wake up, what can you do to have more energy. 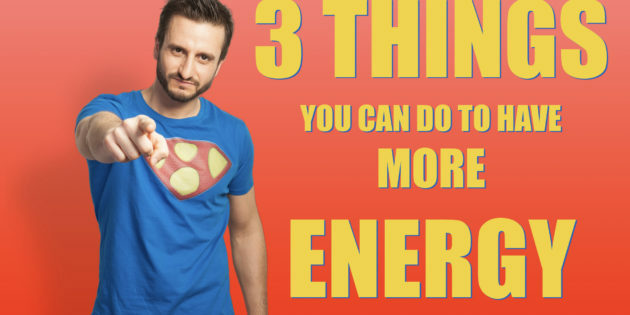 Here are three simple little tips that you can use to have more energy in the morning. Before you even get out of the bed, strive to take some deep breaths. Breath in through the nose (which you should be aiming to do throughout the day) and deep into the belly. Breath out through the nose or mouth. Repeat. Do this for a minimum of 10 breaths and then get up. You’ll automatically have more energy. Our cells need oxygen. The powerhouses of the cells – the mitochondria – need that oxygen to metabolise all the fuel they receive. And also use the oxygen for fuel too. Many people don’t breath properly during the day and especially over night. Especially if you have sleep apnea, or some kind of restricted breathing. Example, a blocked nose. For years I had that issue. And you don’t take in as much oxygen so you get tired overnight! Crazy. Not coffee or tea though! A lot of people the first thing they will consume is a hot drink like coffee of tea. Over night we get dehydrated. From sweat. But also from breathing. Mostly through breathing. We loose up to a litre of water overnight through breathing. That means we need to replenish that. Other than to hug your significant other, the next thing you should reach for is a large amount of water (and not your phone, coffee or anything else!). We’re talking taking an “inner bath” here with 500ml – 1000ml water. We’re familiar with the concept of the outer bath. But an inner bath will clean the internal organs as well as restocking your water supplies. We’ve all had that feeling of feeling a little stiff in the morning. Aim to move first thing int he morning. Something structured. Just for a few minutes. Whether that’s some yoga, or stretching, perhaps rebounding (http://harikalymnios.com/10-ways-rebounding-can-improve-your-health) or just some light mobility work. Doesn’t matter. Don’t overthink it. Just do it. Overnight your fascia (think of fascia as a protective webbing that covers your whole body) gets tighter. And we need to move and stretch to release this. You’ll find that you have more energy when you move your body. Even for just five minutes. I know you can do those three things. Just breath, drink and move. Short and sweet this time. What do you think? Test this out and see.